We’ve noted in the past how a great many accidents happened in mundane circumstances, to a single railway worker – and how this obscured the accidents, as they weren’t spectacular or newsworthy (by the standards of the day). 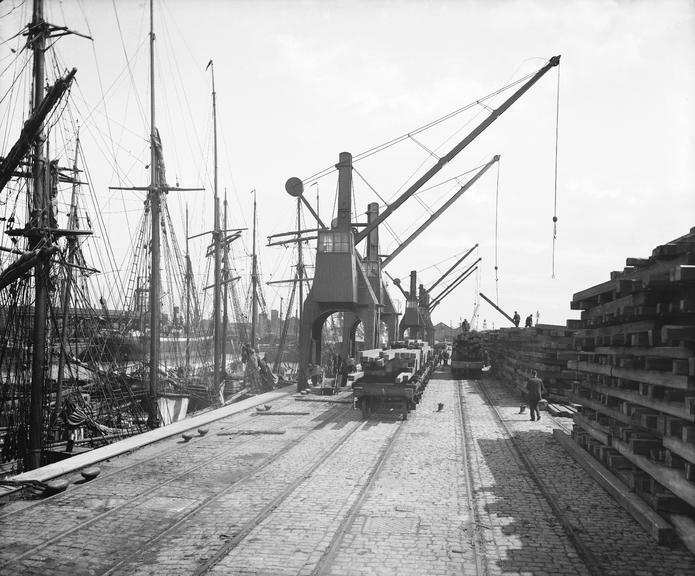 Sometimes accidents affected more than one worker – as in this case, which injured two men at Garston Docks in Liverpool, on the London and North Western Railway. What was more unusual was that both men suffered almost identical accidents and injuries within moments of each other. Contrary to the title of the post, neither man involved was a fool – on the contrary, there was an admirable desire to help a man in distress, albeit with an unfortunate outcome. Timber on railway wagons at Garston docks, 1913. The LNWR had a creosoting plant nearby, which was presumably the destination for the timber being imported. Courtesy National Railway Museum. We’ve blogged elsewhere about a few of the dangers of dock working – both on our own site (here) and for the Port Towns & Urban Cultures website, here. As we might expect, with so much going on, at all times of day and night (to meet deadlines imposed by the tides), it is unsurprising that docks produced plenty of accidents. Garston Docks alone has 14 cases in our database, and it was a relatively small docks – other docks in and around Liverpool contribute more cases. Stalbridge Dock, 1924. The dock hadn’t been built when the area was previously mapped (1906). It must have been very arkward for vessels to get into the dock, as Garston rocks were immediately outside the entrance. Courtesy National Library of Scotland Maps. On 13 April 1911 – just, as it was 1.20am – it became necessary to move a wagon along one of the lines at Stalbridge Dock (part of the Garston docks). To do so, a capstan was used – a revolving drum, powered by electricity or steam, to which a rope was attached at one end, with the other end applied to the wagon. When the capstan was started it would move the wagon without the need for a locomotive; a quick glance at the map (above) of Stalbridge Dock shows numerous dots and initials ‘CN’ or ‘C’ around the water’s edge, illustrating how many capstans were needed to keep the traffic moving. 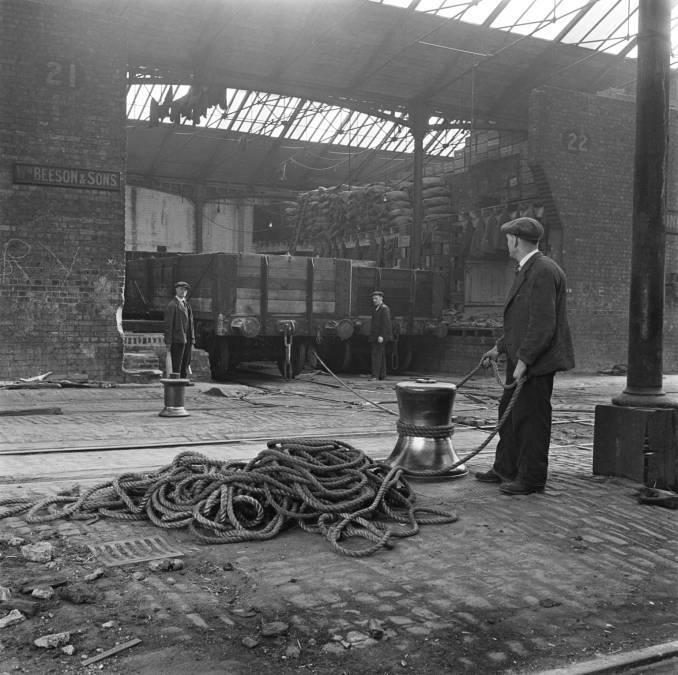 A sense of capstan operation in practice, from King’s Cross in 1951. 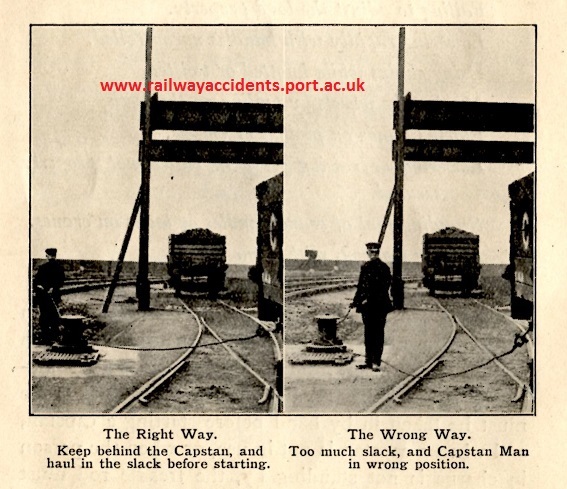 Railway company regulations were generally fairly forthright about capstan operation, making it clear that only trained staff should be allowed to work them. We know that in practice this didn’t always happen, as our database has several cases where the cause of the accident was placed at the feet of unauthorised capstan use (no doubt to get the job done quicker). Indeed, one of those cases took place at Garston Docks in November 1911, when the capstanman allowed an untrained colleague to operate the capstan. 1921 accident prevention booklet advice on capstan use – though not protecting against faulty equipment! Mayes, who had been carrying the rope from the next capstan to meet the wagon, saw what happened. With admirable intent, he ‘went to assist Burrows, but was struck by the rope hook’, also breaking his right leg. Would a more cautious approach on Mayes’ part have prevented his injury? Possibly. His instinct to try to help his colleague was of course admirable, and it was perhaps bad luck that he was hit by the hook as well. The capstan eventually stopped, at which point there were presumably enough workers around to render first aid to both injured men. The capstan was tested, but as Inspector JH Armytage’s report notes, no fault could be found. An intermittent failure, always the most problematic kind, Armytage came up with a possible explanation, concluding that clearances between two pieces of the movement ‘might with advantage be increased’ (1911 Quarter 2, Appendix B). This looks like an even lesser requirement to make the changes than the recommendations sometimes found in the reports – the inspectors were in a tough position, as they had no powers of enforcement to ensure changes were made. They had to rely on the goodwill of the railway companies – something which might be in short supply if it involved significant outlay of money.